Nearly 150 oil platforms in the UK North Sea are expected to be scrapped over the next 10 years, according to industry analysts. The estimate, from Douglas-Westwood, takes account of the fall in the price of oil. It suggested this will result in many oil fields in UK waters, including the North Sea, becoming uneconomic. It said the UK is the country third most likely to see oil fields permanently shut down as a result of low prices. Canada and Venezuela have more production at a cash loss. Just how low can oil prices go? Oil prices: How are countries being affected? 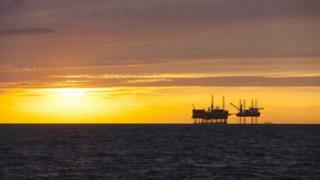 Another assessment of the North Sea, by Company Watch and commissioned by the Financial Times, suggests that half of oil and gas companies with North Sea operations are now loss-making, with total losses for the past 12 months adding up to £6.4bn. The estimate for decommissioning 146 offshore platforms in the seven years to 2016 is part of forecast expenditure of nearly £35bn over the next 25 years. That could be reduced by nearly £5bn if techniques change and depend on so-called "super-heavy lift vessels", says Ben Wilby, of Douglas-Westwood. The first such ship in the North Sea - the newly-built Pioneering Spirit which has been designed to lift topsides weighing up to 48,000 tonnes in one go - is currently being fitted with lifting gear at Rotterdam for deployment later this year. It can lift entire platform topsides or the steel jackets underneath, before taking them ashore for break-up and recycling of materials. That would be less expensive than more conventional cranes doing much of the work at sea, but the super-heavy lift vessel has yet to prove itself and win industry confidence. More information on Douglas-Westwood's forecast for North Sea decommissioning until 2040, is to be published early next week. It is expected to show that Norway's decommissioning programme will be delayed long after most British sector platforms have been scrapped. Around 80% of Norwegian expenditure on scrapping equipment will be between 2030 and 2040, it is forecast. "The time for many North Sea offshore oil and gas platforms to be decommissioned is fast approaching, with the oil price collapse bringing the commerciality of numerous fields into question," according to a preview of the report. "This is likely to lead to a large growth in the number of decommissioning projects planned, putting enormous amounts of pressure on the supply chain. If the industry is well prepared, there will be a major opportunities and rewards for participation in the sector." Another major concern for operators will be maintenance costs. Platforms that have finished producing will need work done on them every year to ensure that they comply with safety legislation. With the oil price low, these fields are no longer seen as viable, and permanent closure (or shut-ins, in industry jargon) is expected to be brought forward. Platforms would then be scrapped to avoid the annual cost of upkeep. It says the global picture is of a low level of oil field shut-ins, despite the low oil price. Only around 100,000 barrels of oil per day have been lost due to such decisions. The analysts see producers as continuing to hope that the price will rise before abandoning reserves. A previous report from Wood Mackenzie, published last September, forecast 150 UK field closures by 2020 even if the oil price returns to $85 per barrel. The price of the Brent crude benchmark has since plunged further, currently trading around $34, and much of the industry is adjusting to prices staying "lower for longer". Analyst Fiona Legate wrote that annual decommissioning spend would surpass oilfield development spending from 2019, and the full cost of scrapping offshore equipment could reach £54bn over the next 50 years. Her report said 30 North Sea fields had been shut in already, with five closures announced in the previous year, and that oil and gas companies had found the cost of decommissioning is turning out to be more expensive than expected. Falling oil prices: How are countries being affected?